Plump juicy shrimp in a smothered in a rich tomato sauce seasoned with garlic, onion, cayenne and hot sauce. One taste of these shrimp with sauce will have you swooning in delight. Serve with rustic polenta, white rice, or just a hunk of crusty French bread. In a heavy skillet or pot melt butter over medium heat. Add onions, peppers, celery, 1/2 tsp salt and 1/4 tsp cayenne; cook stirring, until vegetables soften, about 10 minutes. Stir in both cans of tomatoes, garlic, bay leaves and 1/4 tsp. salt. Over medium-high heat bring to a boil; reduce heat to medium-low. Simmer, uncovered, 35 minutes, stirring occasionally. Whisk mixture back into tomato mixture in the pan; cook, stirring occasionally, until thickened slightly, 4-6 minutes. Season shrimp with the remaining 1/2 tsp. salt and 1/4 tsp cayenne. Add the shrimp to the pan along with the Worcestershire and hot sauce. Cook, stirring occasionally, over medium heat until shrimp turn pink, 4-6 minutes. Remove bay leaves. Stir in scallions and parsley. Place the polenta, 4 cups of chicken stock, and the olive oil in a heavy 2 1/2 quart saucepan and stir to combine. We like using non-stick. Set the pan over medium-high heat and bring to a simmer, stirring constantly with a wooden spoon, until the starch takes hold, 5 to 8 minutes. Whisk in the salt, pepper, butter, and Parmesan. 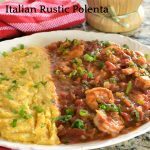 Serve the Polenta along with the Shrimp Creole. Garnish with chopped parsley and scallions. *** We used an old-fashioned polenta that we mail-ordered and it was fantastic. This polenta has the body just like my mamma used to make. You may use a quicker polenta - just follow the directions with your polenta.